For Project We this week the subject is Blue. So I decided to use a picture of me entering a movie theater wearing a blue shirt in Port Angeles, Washington. The movie theater is where they filmed the scenes in New Moon! I got to go see Eclipse for the second time in that theater and it was so cool. I mean I got to actually touch the door where Kristen Stewart and Taylor Lautner touched it. (SO COOL)! The theater was really neat because it was not like any I have been in, in Texas at least. It was small and to get up to the theater you go up stairs. Although I had scene Eclipse before but it was an amazing experiences to see it in Port Angeles and in the very theater that they used to shoot scenes of New Moon. 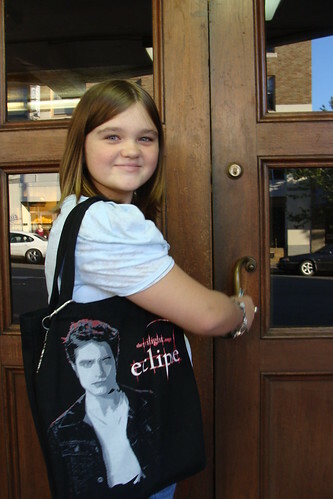 This visit was part of my Twilight Saga tour trip to Forks, Washington for my 13th birthday. My mom shared her Project We post this week by featuring a photo of her and her best friend, Brandy. You are so cute!!! Love this, so happy you have been able to experience so much! So cool! Glad you had fun!